TURFFONTEIN (AUS) (Chestnut 2004-Stud 2010). 5 wins-1 at 2-from 1200m to 1600m, MVRC William Reid S., Gr.1. Sire of 103 rnrs, 51 wnrs, inc. SW Fontiton (MRC Blue Diamond Prelude (f), Gr.2), Fontein Ruby, SP Turfane and of Faint Blaze, Finke, Safariann, Hunters Grace, Turf Crusher, Double Superlative, Lyuba, Turfin' Around, Turtles Nest, Lordfontein, Atomic Lokade, Solar Impulse - First Fontein (H.K. ), Day Two Miss, Give Us a Go, Orange River, etc. VICTIM OF CHOICE, by Choisir. Unraced. Half-sister to CAPE KIDNAPPERS. This is her third live foal. Her first two foals are unraced. CAPE KIDNAPPERS (Commands). 9 wins to 1200m, A$393,700, BRC Chief de Beers H., L, Lightning H., L, Qld Tatt's RC Hardy Brothers Jewellers H., BRC T&J Whitehouse P., Westfield Chermside H., Prestwidge Financial Services H., Ticketek H., Ipswich TC Ray White Dash P., 2d Qld Tatt's RC WJ Healy S., Gr.3, BRC Chief de Beers H., L, ATC Cellarbrations Diamond Beach H., BRC Tate Mason The Good Guys Oxley H., SCTC Summerveld Racing Stables H., 3d BRC George Moore S., Gr.3. Tiger Dimejan. 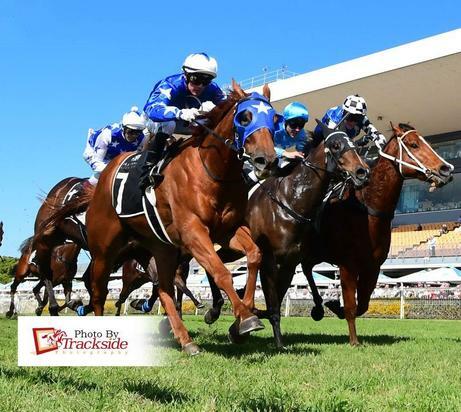 7 wins to 1200m, A$160,200, BRC Ascend Sales H., Coke Zero P., CBS Air Conditioning H., NHP H., Brisbane Marriott Hotel H., SCTC BOQ Chancellor Park & Mooloolaba H., 2d BRC Mount Franklin H., Tate Mason H., 3d BRC Jim Beam P., 4th BRC Mode P., L.
Prime Target. 3 wins to 1250m, A$81,625, to 2015-16, ATC More Than Ready at Vinery H.-twice, Scone RC Dane Shadow & Toyota H.
Double Superlative. Winner at 1350m in 2016-17, BRC Trackside Openair Cinema P., 2d GCTC XXXX Summer 2YO P., 3d BRC Duporth Tavern 3YO H., John Carroll Electrical H.
Our Miss Hearst. Winner at 1000m in Aust. Kidnapper. 4 wins. See above. MARLIN (Sword Dance). 9 wins-2 at 2-from 5½f to 1¾m, US$2,448,880, Hollywood Derby, Gr.1, Santa Anita San Juan Capistrano H., Gr.1, Arlington Million S., Gr.1, Arlington Park Secretariat S., Gr.1, Hollywood Park Sunset H., Gr.2, Santa Anita San Luis Rey S., Gr.2, 2d Hollywood Turf Cup, Gr.1, Meadowlands Young America S., Gr.3, Belmont Garden City H., L, 3d Hollywood Turf H., Gr.1, Belmont Man o' War S., Gr.1, Turf Classic H., Gr.1, Del Mar Eddie Read H., Gr.1, American Derby, Gr.2, 4th Hollywood Gold Cup, Gr.1, Santa Anita H., Gr.1, Santa Anita Oak Tree Turf Championship S., Gr.1. Sire. LINDSEY LANE (Jeblar). 4 wins-2 at 2-at 6f, 7f, Tampa Bay Downs Sandpiper S., L, Gasparilla S., L. Producer. JUST RUSHING (Wild Rush). 16 wins from 6f to 8½f, US$1,011,701, Woodbine Play the King S., Gr.2, Vigil S., Gr.3, Mt Sassafras S., L, Labeeb S., L-twice, Ontario Jockey Club S., L, 2d Woodbine Play the King S., Gr.2, Labeeb S., L-twice, Bold Venture S., L, 3d Woodbine Mile S., Gr.1, Woodbine Kennedy Road S., Gr.3, Ontario Jockey Club S., L, Mt. Sassafras S., L.
ALWAYS SUNSHINE (West Acre). 5 wins at 5f, 6f, US$349,450, to 2016, Pimlico Maryland Sprint H., Gr.3, Laurel Dave's Friend S., L, 2d Aqueduct Tom Fool H., Gr.3, 4th Monmouth Mr Prospector S., L, Parx Racing Hall of Fame S., L.
MY SUNSHINE GAL (West Acre). 5 wins-1 at 2-from 4½f to 1m, US$296,665, Tampa Bay Downs Sophomore Fillies S., L, 2d Monmouth Boiling Springs S., Gr.3, Red Cross S., L, Blue Sparkler S., L, 3d Belmont Marta S., L, Charles Town Oaks, L, Calder Desert Vixen S., L, 4th Aqueduct Lynclar S., L, Calder Catcharisingstar S., L, Monmouth Desert Vixen S., L.
DREAM ON DREAM ON (Untuttable). 5 wins at 8½f, 9f, US$248,925, Calder Needles S., L, Simply Majestic S., L, Mel's Hope S., L, 2d Calder Derby, Gr.3, Calder Pete Axthelm S., L, 3d Calder Lord Juban S., L, 4th Calder Donthelumbertrader S., L.